Hello! Arrived safely and have somehow morfed into the worlds biggest tourists. 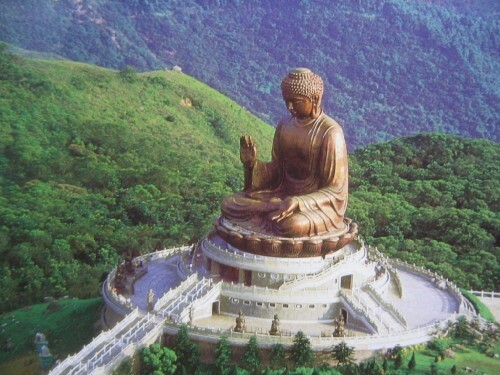 We went to see the big Buddha today (in the picture) was massive and created much confusion as to how it was made. Yesterday and today were spent in high places, we forced ourselves into a cable car and nearly made a lot of mess when it went over the sea. We are the don at chop sticks but can't take any more noodle soup and if you ever go to hong kong don't eat the cuttle fish balls. going to check the weather now because we're going to the BEACH tomorrow as it's not COLD.